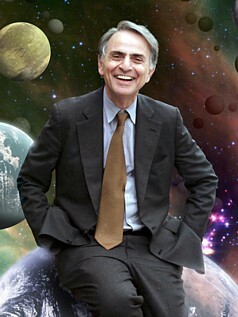 Secular Sri Lanka Post: Happy Carl Sagan Day! Today, on what would have been his 76th birthday, thousands of people around the world are taking time out from their normal routine to pay tribute to Sagan, revisit his meaningful work, and revel in the cosmos he helped us discover and understand. Throughout November, many groups have planned their own tributes with science fairs, conferences, planetarium shows, star parties, COSMOS marathons, and more. Visit carlsaganday.org to find an event near you. Rediscover COSMOS – all 13 episodes – available for free at hulu.com. Check out Sagan's many books at your local library or bookstore using the thorough listings from WorldCat.org. Listen to Sagan's last public address for the Committee for Skeptical Inquiry (formally CSICOP) as replayed on CFI's podcast, Point of Inquiry: "Wonder and Skepticism". Listen to Ann Druyan, writer, producer, and widow of Sagan, discuss life with Carl, his outlook on life, and his famous Gifford Lectures, "The Varieties of Scientific Experience," also on Point of Inquiry. Read the winning entries in the Kepler Mission Team essay contest, inspired by Sagan's "shores of the cosmic ocean" allegory from COSMOS. Refresh your skeptic skills with a review of Sagan's Baloney Detection Kit. special edition COSMOS-themed necklace pendants handmade by Surly-Ramics! Very special thanks to Ann Druyan and Druyan-Sagan Associates, Inc., for their gracious permission to use images and content from COSMOS, and for making it possible for so many CFI branches and campus groups to screen COSMOS for this special occasion. For more information, please visit the Carl Sagan Portal. COSMOS imagery and logo copyright © 1980 Druyan-Sagan Associates, Inc. formerly known as Carl Sagan Productions, Inc. For more information about CFI or Carl Sagan Day, please visit carlsaganday.org or email grassroots@centerforinquiry.net.